Lots of new information has been added to the Incoming database this week, including listings or additional info for David Goyer's The Invisible (on DVD and Blu-ray); forthcoming BBC TWO comedy Freezing; the first volume of Lucasfilm's The Adventures of Young Indiana Jones TV series; Robert Redford's political thriller Lions for Lambs; the Kevin Costner serial killer movie Mr Brooks; and Wes Anderson's terrific comedy The Darjeeling Limited. Gerry Anderson fans might like to know about a series of articles about comic strips inspired by Anderson's shows which will appear in the next few issues of Comics International magazine. 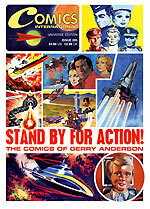 Europe's leading trade paper Comics International is to continue its unique coverage of classic TV SF in British comics with six instalments devoted to the shows of Gerry Anderson. Written by Shaqui Le Vesconte, the worlds leading expert on Anderson in comics, this mammoth and exhaustive series is to showcase artwork by some of the worlds top illustrators who brought the fantastic worlds of International Rescue and Spectrum to life on the page, including such greats as Frank Bellamy, Ron Embleton and Mike Noble. This special series begins in Comics International #205 (March 2008) under a special tribute cover, with an overview of Andersons 45-year long association with comics. With each succeeding 100-page issue also featuring an appropriate Anderson cover, Part 2 (Comics International #206) focuses on the early years spotlighting Four Feather Falls, Supercar, Fireball XL5 and Stingray in the 60s weekly, TV Comic. Part 3 (#207) is dedicated to the many strip incarnations of Thunderbirds while Part 4 (#208) features Captain Scarlet and the Mysterons and everyone's favourite programmable boy genius, Joe 90. Comics based on Andersons live action projects, UFO, Space:1999 and others are explored in Part 5 (#209) while Part 6 (#210) wraps it all up with a look at Project SWORD, Agent 21, Starcruiser and those other Anderson concepts seen only in comics form. Andersons many creations have not just appeared in British titles. His vivid futures hold global appeal to young and old alike. Accordingly, the six-parter will also explore various international editions. Cosmic Publications is offering Gerry Anderson devotees an exclusive a money-saving opportunity to have these six special issues delivered direct to their door every month as they come off the presses. Not only is it dropping its usual 12-issue minimum, but it is offering six issues for the price of five! Get #205-210 for just 15 (19 first class) in the UK; mainland Europe 25/36; rest of the world $60 (air)/$46 (surface). SUBSCRIPTION INSTRUCTIONS: email subscriptions@comics-international.co.uk with your name, address and payment details quoting reference FAB01 OFFER or send to: Comics International (Department FAB01), 8 Galliford Road, Maldon, Essex CM9 4XD, England. PayPal [sales@comics-international.co.uk] and all major credit cards accepted. Make cheques etc payable to Cosmic Publications. Subscriptions enquiries telephone: 01621 877231 [011-44-1621 8772321 from North America]. About Shaqui Le Vesconte: He is a 40-something fan of television and comics. By day, graphic artist; by night, researcher and writer of articles on television, comics, television comics, and anything between. With Kim Stevens, Shaqui is responsible for websites about puppet series Space Patrol and Sara & Hoppity, the history of Gerry Anderson comics, and has written for Star Trek magazine and the website Look-Out. A fourth website, about the Junior TV Times, Look-in, is currently in preparation. About Comics International: Acquired by Cosmic Publications at the end of 2006, Comics International was launched in April 1990 to fill a need for a trade magazine for the US and UK comics industry. From its 48-page 4,000 copy debut, it has expanded to a 100-page monthly with many pages in full colour and a circulation in excess of 24,000. Read internationally by fans, collectors, publishers and creators, it is the independent guide to the world of English-language comics.